In 2010, with over ten years of irrigation experience, founders Tom Olson and Russ Jundt were increasingly disturbed by the tremendous amount of water wasted by typical irrigation systems. 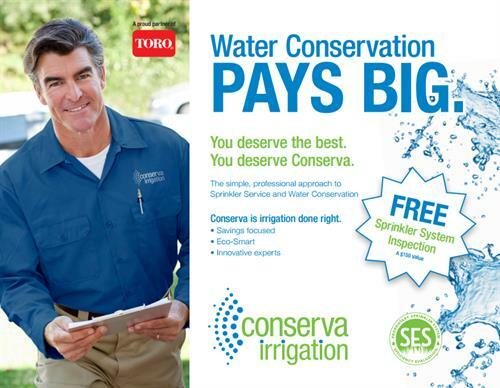 They founded Conserva Irrigation to directly address this waste, making Conserva the only irrigation company founded solely on the principles of conservation. We've worked hard to make water conservation economically feasible. Our affordable solutions employ a profound blend of technology and design, developed after considerable study of available technologies, water dynamics, environmental concerns and best horticultural practices. Typical systems installed by Conserva use 30% - 60% less water than a traditional system! That water savings (achieved with minimal material or energy impact), can make a huge difference to a planet facing serious environmental concerns. And as irrigation accounts for up to 67% of our fresh water use, run off from over watering carries large amounts of fertilizer into our fresh water lakes and streams. Conserva Irrigation systems greatly reduce or eliminate the run off that contributes to municipal overflows, protecting your drinking water sources while conserving your community's water supply. 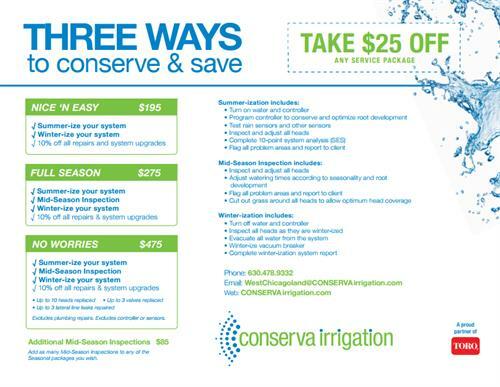 30% - 60% Water Savings!